A roof is the cap on the structure which will ultimately protect your family from the proverbial storm. Therefore it must be impregnably durable, aesthetically assuring and efficiently weather resistant. We've come a long way since the days of wooden roofing and asphalt shingles. There's this new resource which is better suited for the job. It's called metal. Rock, Wood, Metal - Roof! Metal and asphalt have been deadlocked in a battle for the builder’s heart, for over a hundred years. Asphalt: The antique building material of our fathers. It's cost-effective and easy to install. Metal: The scientific choice of the neon-age. It can come resplendently polished or it can have an affected rustic look. It’s also more durable than asphalt, which means less repairs and ultimately less Advil for homeowners. 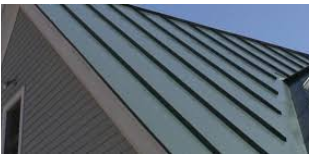 Metal is the superior roofing material in the category of severe weather performance. Asphalt shingles have been employed and venerated by builders for years and years. This is by far the most common roofing material - 4 out of 5 homes have asphalt roofs. It is a historically tested product. Builders and homeowners alike have fully absorbed the pros and cons of asphalt shingles. It is also an economical product that won't break the bank. But with these convenient comforts come a few appreciable downfalls, especially in areas, like New England, that see their fair share of severe weather. Asphalt is inherently susceptible to wintry storms of hail, freezing rain and heavy snow - or as we call them “nor'easters”. If asphalt shingles are not properly exposed to sunlight and dehydrated after torrential storms, mold and mildew can develop. One thing that we're all familiar with up North: Ice Dams. The formation of these pesky ice deposits is caused by a fluctuation in roof temperature. Asphalt roofs usually have a center that is warmer than the perimeter. This is because heat does not propagate asphalt as easily as it does metal. Snowmelt trickles and eventually re-freezes on the edge of asphalt shingles. And it can subsequently drip down into the insulation and the attic causing structural damage. Ouch! Although it's the more affordable material, the costly headaches of asphalt shingles go unredeemed. Peace of mind is an invaluable luxury - one that metal roofing can provide a homeowner with. Yes, the initial investment is slightly greater, but in the end, metal roofing pays for itself. These roofs, oftentimes consisting of copper and zinc, can last up to 100 years. Distributors offer limited warranties of up to 50 years. But here's the thing: You probably won't need to exercise that warranty. Metal roofs can easily withstand the pernicious snowfall of New England Winters and the unrelenting rains of Spring. Metal is less porous than asphalt, so it doesn't develop pockets of mold and mildew. Heat disperses quickly across metal roofing, preventing the formation of ice dams. This means little to no maintenance headaches and no water damaged infrastructure (which can lead to repairs inestimable). As much as it is environmentally resistant, it is also environmentally friendly. Companies will incentivise you to recycle your metal roof. In fact, if you're looking to be super eco-friendly, you can even purchase a recycled aluminum roof for your new home! Now that we're fully immersed in the healthy turbulence of the holiday season, it's easy to imagine what a hassle roof maintenance would be around this time of the year. You want to be able to gaze upon the falling snow, through your steam-fogged window, knowing that your family and home is protected. The vulnerabilities of asphalt shingles could leave you out in the storm, when the severe winter weather inevitably hits. Sure it is more affordable than metal, but a price cannot be placed on the comfort of reliability, especially up here in the Northeast. If you want heartening durability, a modern design and a weather resistant roof - go with metal. Your home will thank you for it.